The Duterte regime has been in power for more than one year now. Since Duterte’s election more than 13,000 (mostly poor people) have been being killed by the state police in his “war on drugs”. Despite these widespread killings, there are no massive and widespread condemnation and protests among the poor people, even by the victims’ families and relatives. Instead apathy and fear prevail. A significant portion of the population, even among the poor, felt “relieved” that these “outcasts”, “evils” of society have been eliminated. Even though it is accepted that there are many innocent victims, there is a significant acceptance among the population that this is “justified collateral damage” for the interest of a general cleansing. And the (admittedly manipulated) surveys by bourgeois institutions claim that Duterte enjoys “excellent trust ratings”. In short, we are seeing a real culture of killings. Why is this happening in the country that overthrew a dictator 31 years ago through a combination of military coup and a “people’s uprising” led by the bourgeois opposition? Why the acceptance of killings and violence? Duterte’s “war on drugs” is a war against the poor. According to the analysis of some Filipino leftists, Duterte was catapulted to power through a “revolt” of the masses against the neo-liberal policies of the past administration. Some of them even say that the Duterte phenomenon is the “rebellion of the lumpen proletariat”. This is clearly false. Not only does Duterte continue the neo-liberal policies of the previous administrations, he has also killed thousands of lumpenised poor people. To understand clearly and correctly the rise of the likes of Duterte we must understand first the world system we are living in and its evolution. Not only that. To understand the evolution of world capitalism means to comprehend why we are witnessing the dominance of “every man for himself” and this culture of violence. Despite the whipping up of hatred and the campaign to kill suspected users and pushers of illegal drugs, most of whom are those living in slums, the supply of smuggled drugs mainly from China did not stop. On the contrary. Lately, the state apprehended drugs valued at 6.4 billion Philippine pesos. The smuggled drugs smoothly passed the eyes of the Bureau of Customs whose chief commissioner is a Duterte loyalist. Implicated in this drug smuggling is the son of the president and the current vice-mayor of Davao City. 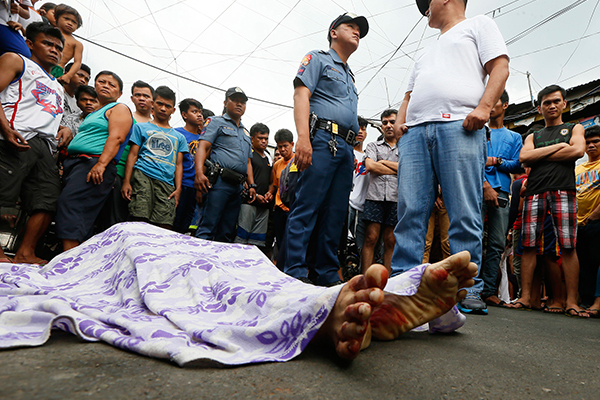 Furthermore, while the poor are summarily executed by the state, the suspected drug lords are giving favor by the democratic due process of the state. Recently Duterte admitted that he could not control the drug problem. This is a 360 degrees turn-around of his campaign promise last election in which he boasted that he could solve the drug menace within 3-6 months. We can thus see that the state itself is not only unable to fight those forces who benefit from the drugs trade, that it is totally unable to eradicate the problem: instead the State becomes the open promoter of barbarism, terrorism – and drug trafficking. But since we are living in a society which offers humanity no future, significant numbers of the poor and the petty bourgeoisie are infected by the culture of nihilism, despair and hatred and are prepared to support Duterte’s phony solution, based on generalising hatred and violence. Parts of the poor and the proletariat are thus mobilised against another section of the oppressed who are being used by drug and criminal syndicates, agreeing that they are “outcasts” of society that must be killed. And because of the spreading attitude of “every man for himself”, of social atomization, as long as you or your loved ones are not victims of this cycle of killings, there is no feeling of sympathy and solidarity. At the same time, the chaos, violence and killings perpetrated by the state are also the fertile soil of the ISIS-inspired Islamist terrorism in Mindanao, where we also see the incapacity of the state’s corrupt military to quell even a small number of terrorists occupying a small city in Mindanao. Filipino workers on their own cannot lead society in the Philippines out of this chaos. The problem cannot be solved within one country; Filipino workers must unite with their class brothers and sisters in other countries to destroy world capitalism. However - and this is again an international problem - Filipino workers seem to have lost their class identity. This is aggravated by the fact that the leftist organisations and the unions are controlling their struggles – if they struggle - and as a consequence they are fighting not on their own class terrain but as atomised individuals under the banner of “citizens of the nation”. In the protests against killings of the poor, workers participated as pawns of the bourgeois liberal opposition and the left, who spew the poison of democracy and “human rights”. In the history of the workers’ movement in the Philippines there was no period during which the workers struggled as a truly independent class. For more than 100 years of their history, workers’ struggles were generally controlled or influenced by the different bourgeois factions, using the unions and the parties of the right, but above all of the left. In the Philippines, Stalinism, especially in its Maoist form, is the dominant ideology infecting the workers’ movement. Many observers said that the Duterte regime is worse than the Marcos dictatorship. This is true. But it is also true that under Duterte, the left more openly shows its face as an instrument of the capitalist state. During the election campaign the Maoists openly campaigned for Duterte while the other factions of the left threw in their “critical support”. The Maoists were rewarded by Duterte through appointments of their cadres and close allies to his cabinet. It is vital that workers learn from history the lessons of the left’s alliance with the state. An independent working class movement means no alliance with any factions of the ruling class. Instead all factions of the class enemy must be exposed and opposed in front of the working masses. In addition, when different factions of the left and right are trying to mobilise the workers either to support imperialist USA or imperialist China in the contested islands in the South China Sea or West Philippine Sea, any form of nationalism or defense of the country must be rejected. Instead Filipino workers must hold up the banner of proletarian internationalism: workers have no country to defend. There are protests organised by the bourgeois opposition, church and leftist organisations. But there is no significant spontaneous participation among the population. The late dictator Ferdinand Marcos Sr, who ruled the Philippines for 16 years after 1965 was overthrown on February 1986 in what was popularly known as the “People Power Revolution”. This scandal has already been picked-up by the national and international media. There were only a handful of “narco-politicians’ being killed by the state police as a “show case”. The ISIS-inspired small local terrorist Maute Group attacked and occupied Marawi City in May 2017. At the time of writing the military, despite its full mobilization, is still not able to completely “liberate” Marawi from the terrorists.